2997 Red Potion Crates = 29,970 Red Potions. 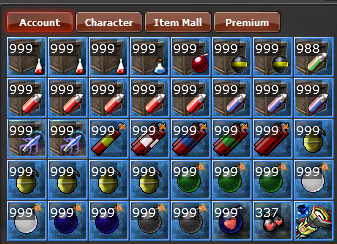 999 Blue Potion Crates = 9,900 Blue Potions. 999 Blaze Shell Crates = 99,900 Blaze Shells. 1998 Bomber Shell Crates = 199,800 Bomber Shells. 988 Poison Bullet Crates = 98,800 Poison Bullets. 4995 Fire Bullet Crates = 499,500 Fire Bullets. 2997 Cold Bullet Crates = 299,700 Cold Bullets. 1998 Chromium Bullet Crates = 199,800 Chromium Bullets. 1,457,487 munitions aimed at YOU! with love, of course. a storage you can respect, because this was EARNED.